In Particles + Waves with Plausibility, artist Dennis Balk employs various forms of visual expression—from abstract, digitally created images to straight photography, not missing many steps in between—to explore the relationship between models for subatomic particles, designed by the artist, and the day-to-day life of human beings. Balk shows us his models as they take on shape, form, and personality, displaying patterns of behavior similar to that of human culture. Just as we pass on elements of our cultural identity through social interactions, each particle has a specified code, formed from its physical qualities, that passes from receptor to receptor to other particles in subatomic space. Using scientific methods such as nanotechnologies—engineering processes that operate at a molecular scale—Balk confronts the possibility of the visual description of subatomic material (material that, even with the greatest of modern technologies, cannot actually be seen). 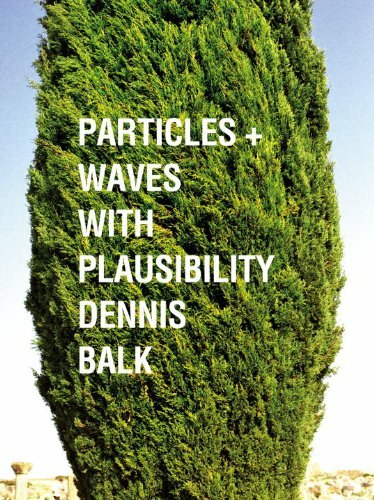 As Balk explores the boundaries between science and culture, Particles + Waves with Plausibility sets us back in time in North Africa, beginning with early Egypt and the Giza Plateau. From these often-mythologized cultures and histories, the scale then closes in—taking us forward in time, closer to specificity of place, and into the limits of contemporary scientific knowledge. Balk bounces from photographs depicting everyday human existence to images describing the dramas of subatomic material, leaving the viewer to wonder: Is this connection a fiction, created by Balk’s designs, or are our mysteries intimate with the mysteries of modern science? While we may never answer these questions with certainty, Balk contends that “the process frames (this) science, which becomes a narrative that facilitates a kind of reality.” Be the first on your block to have one!